The Galapagos Islands is an ideal vacation destination for the entire family. Not only mom and pop and the kids, but also grandparents or other generation of kinfolk can explore these incredible isles together. Having three or more generations embarking on such a journey together poses some challenges. Here are three tips to help you plan your dream Galapagos adventure and create enchanting family memories. Lay out the snacks and sit down together (or schedule a Skype conference call). What would you like to see? What activities – birdwatching, snorkeling, bike riding, kayaking, hiking, scuba diving – would each of you like to do? What are the younger travelers’ attention (and patience spans) like? Does anyone have physical limitations? Be sure to also discuss the budget of each of the participants. Island Cruising or Land-Based Tourism? The next decision to make is whether to take a multi-day Galapagos cruise or to island-hop through the archipelago. Galapagos cruises last from four to ten days. Many larger ships offer separate activities for children, with programs and activities specially tailored for them. These boats also offer alternative activities for those with mobility issues. If your group is large enough, you may consider booking an entire, smaller yacht for your clan. All cruises have itineraries that allow for resting between visitor sites, and you don’t have to worry about finding a place to eat. All your needs aboard ship are taken care of. No matter if you choose a small or large ship, be sure to check for children discounts! Land-based tourism is another choice, which would allow family members to rest more between activities, or set off in small groups to do different things. This is also a better option if someone in the family suffers from sea sickness. Many day trips can be planned on Santa Cruz, San Cristóbal and Isabela islands that the entire family can participate in, and it is easy to travel by local ferry or plane between the islands. In the days of old, scientific expeditions to the Galapagos Islands included an artist, a photographer and a historian aboard. Your entire family can join their creative talents to create a scrapbook that will be an ever-lasting memento of your multi-generational vacation to these isles. The album can also include drawings, photographs and a video, and perhaps a bit of poetry. To get more tips for planning your vacation, also check out those offered for family and older travelers to the Galapagos. The Galapagos Islands has a bit of everything for everyone in your family, whether 7 years old or 77. You will create memories together that will last for generations to come. 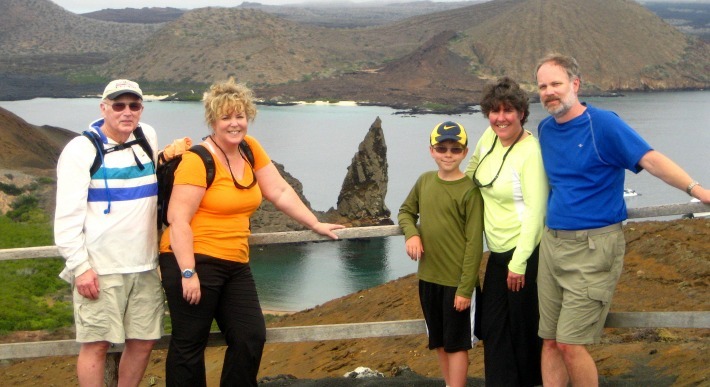 Are you planning a multi-generational trip to the Galapagos islands? Or have you done one? If you have any tips to share with other travellers please leave a comment below.